There’s a toll tunnel out of Reykjavik, which was thick with smog from traffic fumes. We emerged coughing into the sunrise, which is less impressive than it sounds because sunrise at this time of year is at 10 am. 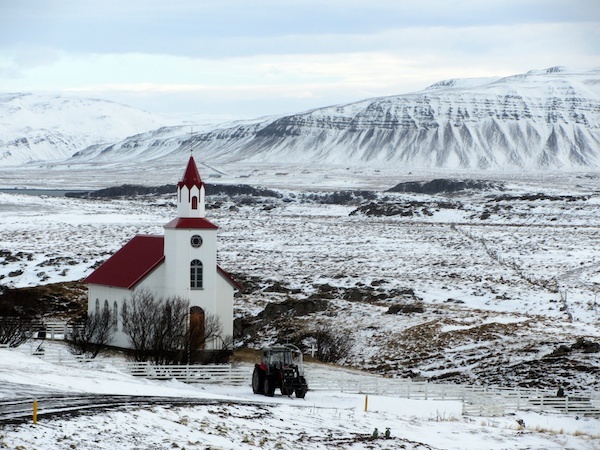 We were heading around Iceland’s ring road for the western peninsula of Snæfellsnes. The GPS in our hired 4WD kept saying “Please take the second exit from the roundabout onto One”, until we turned her off, because there is broadly speaking only one highway of any length on Iceland, which is the One that we were on. The landscape near the city was rugged with gnarled volcanic rocks dusted with snow, but as we climbed higher we began to see enough forage for the ubiquitous Icelandic ponies. 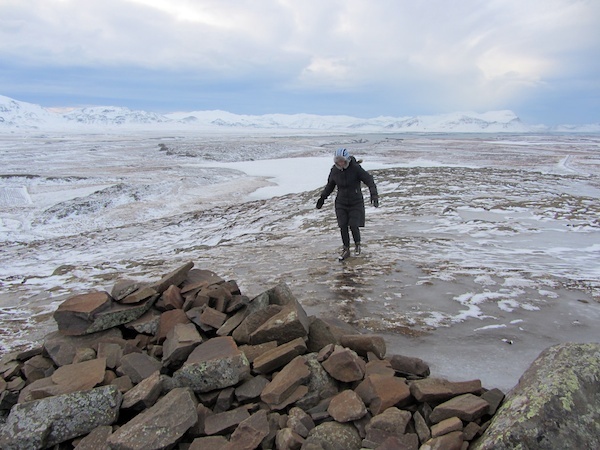 Once we arrived at the peninsula, we decided to circumnavigate it anticlockwise, taking in the Snæfellsjökull (glacier) on the way, if the pass happened to be open. The northern coastline is dotted with little fishing harbours, and we stopped in one for lunch. We ate the local cod, which was fresh and beautifully prepared. The bartender was an ex-fisherman, and I asked him about the depleted cod stocks that had been on the UK news for much of the late 1980s, but he said that as far as they were concerned, there had never been a noticeable cod shortage, and there had always been plenty to be found. We had noticed a number of tasteful roadside sculptures along the way, and were rather impressed by some of the modern churches. The one on the hillside above the restaurant had a lovely sweeping modern exterior and a simple Lutheran interior, complete with a beautiful stainless-steel organ and a simple oil painting instead of an altar piece. Our next intended stop was down a track which we judged too icy even with our studded tyres, so we continued on to the turn-off to the glacier. We quickly encountered a sign which stated in English ‘Impassable’. We checked with a local who was working on his truck, and he said laconically, “Closed. There is snow”. As we drove off, the glacier dumped a blizzard across our windscreen. 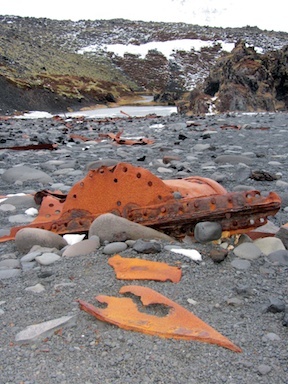 The change of route gave us the opportunity to drive on to Djüpaloénssandur and walk down to the black sand beach, which is littered with the remains of a trawler which went ashore in 1948. The wreckage has been left as a monument to those who died, and touchingly it does not seem to have been disturbed except by the sea. On this beach are the ‘lifting stones of Dritvik’. These are four large boulders of varying weights alongside a flat waist-high platform. The story goes that if you could pick up the 25kg ‘weakling’ and put it on the platform, then you could work onboard a Dritvik fishing boat in a junior capacity. In order to work as an oarsman, you needed to lift the 54kg ‘half strong’. Bronwyn managed the weakling, I managed the half-strong, but neither of us attempted the 100kg or 154kg weights. As dusk was falling, we started to look for restaurants along the way, because we had gained the impression that there wasn’t a restaurant at our next hotel. The few that we found were either closed for the season or not yet open for the evening. In the end, Bronwyn phoned ahead to ask if we could get anything to eat close to the hotel, and they rather tentatively suggested that we should book into their restaurant. Thank goodness that we did! Both the hotel (Hotel Búðir) and the restaurant were stunning. Fine dining overlooking the fjord, with the mountains glowing in the background. The food – an untranslatable local fish – was gorgeous. Afterward we whiled away the evening with locally brewed porters and that typical Icelandic duo of birch-bark liqueurs, Björk and Birkir. 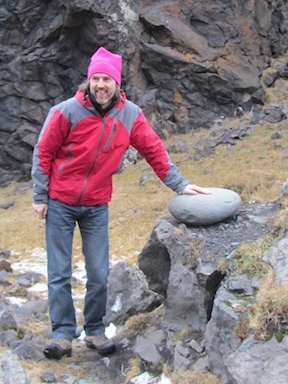 This entry was posted in Europe, Iceland, Travel on 2014/02/04 by Reinhard. 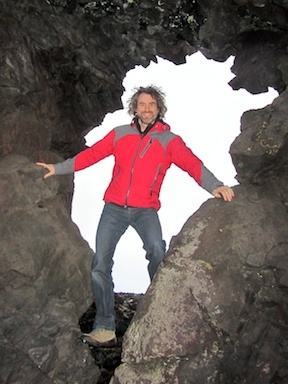 Is there something about Iceland and being 50? My mate is out there this weekend for her 50th and as you know, we are off there in May for mine. Glad it all looks as wonderful as hoped it would be when we looked into it. Hope you get lucky and see the sky dancers. We are drooling over our National Geographic map and Rough Guide whilst working out your route.